Sunshine, happiness, being in love, and getting smothered with hugs and kisses from your kids and husband. Those are a few of the little things in life we can sometimes take for granted, but they're the moments that sustain me. It may sound dorky, but I get such incredible joy and satisfaction from throwing a little Valentine's Day party for our family every February 14th. Complete with balloons, special love notes, and tons of Valentine's inspired food, I think I look forward to it as much as Christmas or my birthday. Over the years I've made everything from Raspberry Cream Cheese Heart Tarts to Raspberry Shortbread Hearts (yes of course, heart shapes abound) for Valentine's Day, but this year the kids have specifically requested cupcakes. Red is obviously the color the holiday calls for, but not wanting to use food coloring I worked hard on a natural substitute for this recipe. 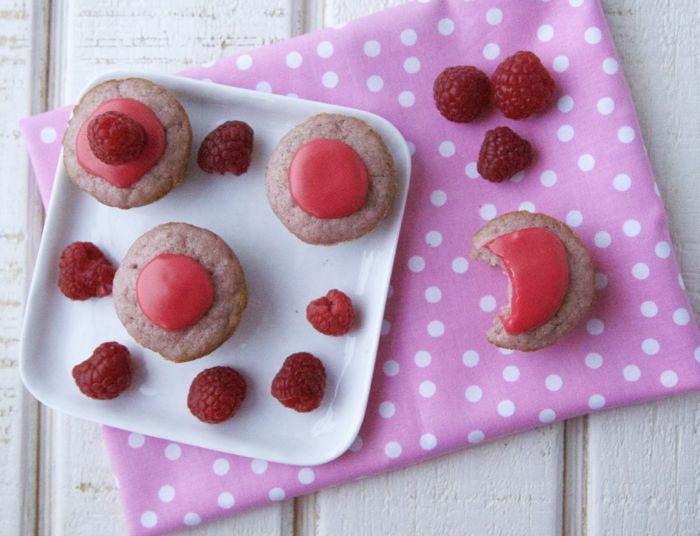 These pink cupcakes are made using the bright crimson juice of defrosted raspberries which render them a gorgeous shade of pink and add a hint of fresh raspberry flavor. I did a taste test for these cupcakes with Kenya and Chloe and got a big thumbs up from them both. I'm guessing that after just one bite, your crew will fall in love, too! 2. In a bowl, whisk together the flour, baking powder and salt. 3. In the bowl of a stand mixer or with an electric mixer, cream together the butter and sugar until light and fluffy, about 3 minutes. Add the eggs, and mix until combined. Then add the vanilla, milk and raspberry juice. 4. Gradually add the flour mixture to the wet mixture until combined. 5. Fill greased muffin cups about 2/3 full. Bake for 15 minutes (about 22 minutes for regular sized cupcakes), or until a toothpick inserted in the center comes out clean. 6. To make the frosting, in a bowl mix together the powdered sugar and 2 tablespoons of raspberry juice. Stir until smooth. Tip: Defrost 2 cups frozen raspberries and press them through a sieve into a bowl reserving only the raspberry juice for the recipe. I love Valentine's too! My 4 year old son is having a Valentine's party this year and I definitely will be making these as well as some of your other recipes. I was also thinking of letting them drink from tea cups. Any suggestions on what to serve? I can't wait to send these in as a special school snack this month! Whoops! Yes. I added it! I try not to ask if you've tried other ingredients and if they work, but... Would grape juice work? I know it wouldn't be a pretty pink.... But purple is liked around here too. I'm not sure about the grape juice because that is very thin. I haven't tried it, but if you take frozen mixed berries, defrost and squeeze the juice out of them it is a dark reddish/purple color. So maybe that would turn the cupcakes a purple hue? I definitely want to test this now! I'm not sure what I did wrong, but my cupcakes are not pink! At best I would say lavender, but my 2.5 year old just called them blue. Taste is pretty good, the raspberry juice was bright red, but something is off. I'll try again, hoping to perfect it before class parties next week! Thanks. Same results here! The juice was bright red, but the cupcakes were a vague gray-blue. Tasted yummy though. I think I will try the red beet frosting to salvage the Valentine's theme! Could you use whole wheat flour instead of the all purpose? You can, but the cupcakes will come out very heavy and dense! Do you think substituting honey or agave for the sugar would work? Or would the consistency change too much? I don't have mini cupcakes molds... what would I need to change to make regular size cupcakes? You'll just need to bake them about 22 minutes! I would love to make these for my niece and nephew for Valentine's Day. Quick question. I don't have a mini muffin pan but have been doing your suggestions for other recipes when using a regular size muffin pan when you say how many tablespoons of batter. In this recipe it says 2/3rds full for the mini muffin tray. Do you know approx. how many tablespoons of batter this would be? You could make this is a regular muffin tin! Just fill 2/3 full (just like you would with the minis) and bake about 20 minutes, or until a wooden pick inserted in the center comes out clean! oh i love that you don't use artificial coloring! definitely pining these tips for when this kiddo gets older. These were great and tasty! The inside of the cupcake was definitely more purple than pink, but the frosting was a great shade of dark pink.